Long Beach Unified School District Superintendent Christopher J. Steinhauser, Long Beach City College Superintendent-President Eloy Ortiz Oakley, California State University, Long Beach President Jane Close Conoley and Long Beach Mayor Robert Garcia gathered last week to share successes of The Long Beach College Promise during a celebration event. Addressing an audience of about 300 at the waterfront Hotel Maya, the leaders provided data regarding college readiness, college enrollment, guaranteed college admission, tuition-free courses, internships and early childhood education. State Assemblymember Patrick O’Donnell, who chairs the Assembly Education Committee, received the College Promise Champion Award for his efforts to help fund replication of The Promise statewide. The Port of Long Beach was recognized as a Promise Partner for its support of the initiative through internships and other programs. At the annual event, officials also awarded 24 scholarships ranging from $50 to $250 to eighth graders who have shown academic improvement, and Southern California Edison presented a $20,000 check to support The Promise. In less than a decade The Long Beach College Promise has become a national model, influencing America’s College Promise, supported by President Obama, and dozens of local initiatives throughout California and the nation. Most recently, the U.S. Department of Education released its September 2016 “The America’s College Promise Playbook” featuring Long Beach among exemplary programs. Local leaders detailed several other recent successes at the event. • Students in LBUSD signed up for more than 13,000 Advanced Placement college-level exams in 2016, an 82.4 percent increase in four years. • Class of 2016 graduates in LBUSD earned $93.6 million in scholarships and grants, a five-fold increase since a decade ago. • About 75 percent of LBUSD’s high school graduates now enroll in college within one year (and 80 percent within two years). • Nearly 13,000 students have received a free semester of college at LBCC. • In 2016, LBCC expanded its tuition-free education to one full academic year for qualified LBUSD graduates. • Of the LBUSD seniors who go on to enroll at a two-year college, 88 percent enroll at LBCC. • The number of LBUSD graduates enrolling at CSULB has increased by 71 percent since the inception of The Promise. • Graduation rates at CSULB have significantly increased for Latinos, African Americans and Asians. • Approximately 2,600 internships have been added. • Approximately 900 additional children have enrolled in preschool. Eight years ago, LBUSD, LBCC and CSULB committed to The Long Beach College Promise, extending the promise of a college education to every LBUSD student. The City of Long Beach signed onto a renewed and expanded version of The Promise in October 2014. The Promise aims to fulfill the potential of all youth by providing continuous support along every step of the student experience, from pre-K through college and onto career and life. The effort’s significant gains in college readiness and enrollment have attracted the attention of policy makers at the state and national levels. “Today is a celebration of our students, who are wisely taking advantage of the opportunities that The Long Beach College Promise offers,” LBUSD Superintendent Steinhauser said at the event. 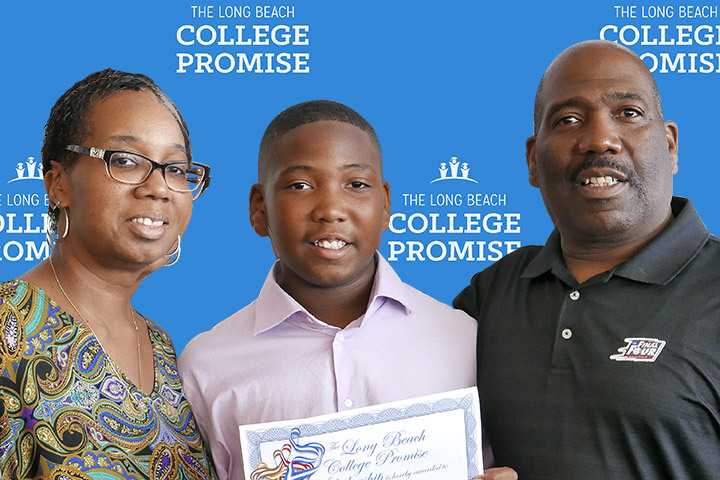 COLLEGE PROMISE – Jewell Williams, Michael Williams, Jr. from Rogers Middle School, and Michael Williams, Sr. attended the annual celebration of The Long Beach College Promise. The Rogers student was one of 24 local eighth graders to receive scholarships at the event.